A report that former Armenian president Robert Kocharyan met with Russian Prime Minister Vladimir Putin in Moscow on Monday (December 20) has given rise to press speculation that the former president is plotting a political comeback. 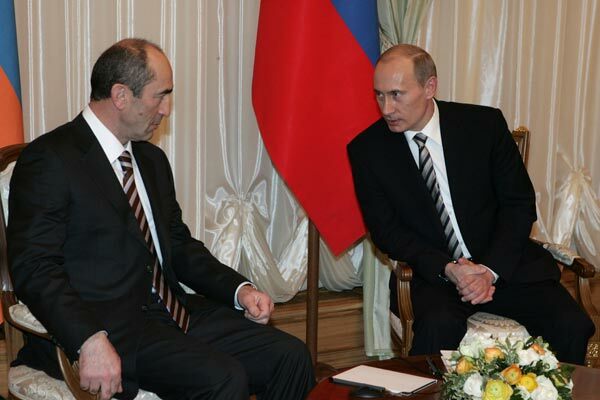 The Kocharyan-Putin meeting was confirmed by the head of the ex-president’s office Victor Soghomonyan. Since his retirement in 2008, the second president of Armenia has led a mostly non-public life, rarely attending public events. Still, during this period reports have been coming about Kocharyan’s high-level meetings at home and abroad. In March 2009 he made a trip to France where he met with former French President Jacques Chirac, in January this year he visited Iran where he was received by President Mahmoud Ahmadinejad. He also met with newly appointed U.S. co-chair of the OSCE Minsk Group Robert Bradtke in Yerevan last spring. Since his resignation as president Kocharyan has given only one major interview, in which he criticized the government’s economic policy and also voiced harsh criticism over the initiatives of the current president on Armenian-Turkish normalization. Experts see the Kocharyan-Putin meeting as signaling the start of Armenia’s 2012 parliamentary election campaign. At least two major parties, Prosperous Armenia and the Armenian Revolutionary Federation (Dashnaktsutyun), are believed to be Kocharyan’s support bases in Armenian politics. Head of the parliamentary faction of the ruling Republican Party of Armenia Galust Sahakyan takes Kocharyan’s meeting with the Russian prime minister in its stride. “The meeting of the ex-presidents of the two countries is likely to have been initiated by Putin and was of a protocol character rather than was conditioned by the need to solve any major political issues,” Sahakyan told reporters on Thursday. According to the senior Republican Party member, Kocharyan has no serious influence on political processes in Armenia and has an “inert position”. However, he said, it does not mean that he is not interested in the fate of Armenia. Meanwhile, the leader of the Prosperous Armenia party, tycoon Gagik Tsarukyan has not yet said whose candidacy he will support in the 2013 presidential election. His party is one of the two junior partners of the Republicans in the current governing coalition. In its turn, Dashnaktsutyun, which quit the coalition in May 2009 over what it considered the current administration’s conciliatory position in the Armenia-Turkey rapprochement, has slammed the current authorities for “failed foreign and domestic policies” and aims to achieve a leadership change, i.e. “the change of the president, the government and the National Assembly”, as was stated by the party’s senior representative Armen Rustamyan. Speaking about the change of power, Dashnaktsutyun has in mind the next parliamentary and presidential elections. Meanwhile, ex-prime minister Hrant Bagratyan, who is currently a leading member of the extra-parliamentary opposition Armenian National Congress, does not believe that there are any serious differences between Prosperous Armenia and the Republicans. “Tsarukyan or Kocharyan cannot go against the authorities. These games are just for increasing their share in power and not to lose what they have,” says Bagratyan.